Aditya Birla Nuvo – Our Top DEFENSIVE Pick. Over the last 6-8 months have been mentioning about Aditya Birla Nuvo as a best defensive bet to be bought at 820 and lower in a systematic manner and to slowly book at 900-970. We got almost 2-3 swings in this 820 to 950 range trade :). Just like we got 180 to 210-220 for Godrej inds before it flew to 260 recently. Now this time around i would not like to book it at higher levels as with time the Valuation comfort has increased. 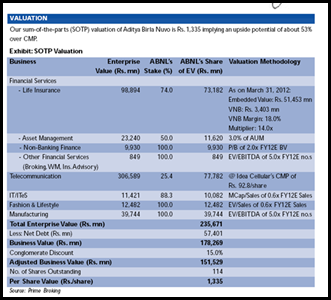 Above is an older SOTP calculation done in a report of Prime Securities. Now let us look at it in current light. Mind you the calculations are approximate. What has changed from a enterprise value of 17800 crores and post a 15% conglomerate discount giving a value per share of 1335. 1) The Life Insurance business valuations look in line with the Reliance Insurance stake sale valuing Reliance Life at 11500 crores. 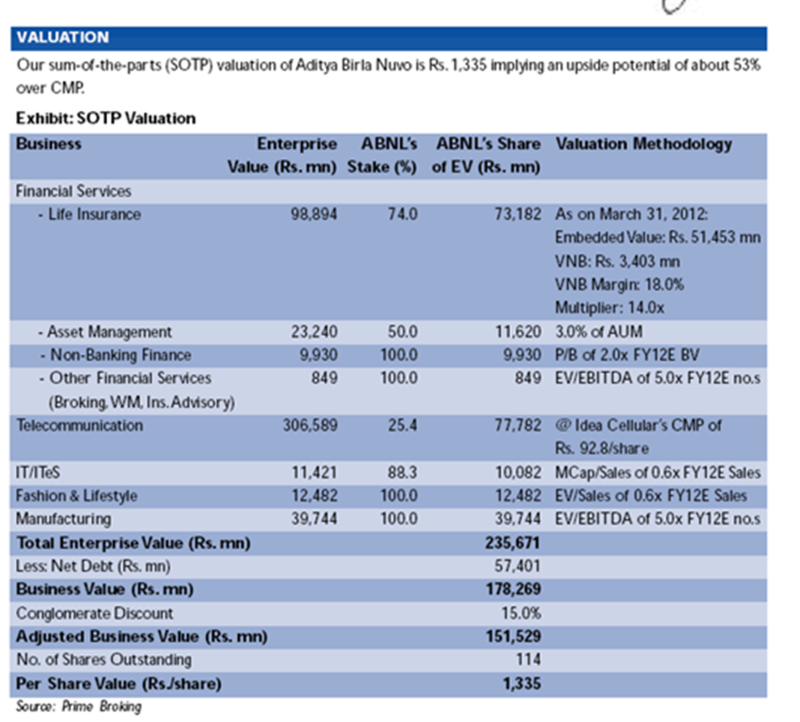 So with 8.6 % market share the valuation should be around 10k crores for Birla Sun Life. 2) The AMC business of Reliance Capital was valued at almost 5-6% of AUM. The above calculation keeps it to 3% of AUM. With last standing AUM of 63k crores. AB Nuvos share in AMC business stands now increased at 1.5 k crores. 3) NBDC and Broking business should pick up but will give same valuations. 4) Idea and Hindalco holding value should be around 8300 crores. 5) IT business at 1000 crores. 6) The Fashion and Lifestyle business has been catching up nicely and should do around 2000-2300 crores sales. Would give it a valuation of price-sales of 1 given the growth. so that value comes to around 2k crores. 7) Manufacturing has also grown but will give a valuations of similar to previous 4k crores. So all of this comes up towards 25k crores roughly. So we have a net holding value of around 18k crores even after an increasing debt and giving very conservative valuations to the above businesses. Apart from Idea-Hindalco stake and 50% in AMC all the other major businesses are 75-100 % owned subsidiaries. So whether we should give it a holding discount or a conglomerate discount. Considering a rough discount of 30% discount the stock can quote at a market cap of 12600 crores. Even if i were to give a 50% discount it should quote at 9k crores which is too high a discount and that would imply a 10% downside from current levels. The current market cap of the company is around 10300 crores. So one can expect a 20-25 % upside on a conservative basis in the medium to long term. ideally it should be way higher over the next 2-3 years. A must in a conservative long term portfolio as a very reliable management. Now let us look at the trigger points or wishful thinking which can change the valuations to a totally different level over the next few years. Stake sale in any of the subsidiaries. 1) Madura Garments as per market buzz a year back was valued at 4k crores but management needed a higher price. We are just taking a 2k crore valuation. 2) We can see benefits for Insurance sector in form of some reforms. 3) Can we see some restructuring or hiving of IT or other businesses. 4) Will Idea be sold off over the next few years? 5) Will we see the manufacturing capacities increased big way ? Even without the above triggers we have a valuation comfort but if any of the above or something else were to give a positive surprise we may get aggressive returns out of the stock. We maintain the view of buying the stock at current levels and on dips till 850 with a short term , medium tem and long term view. Keep booking partial profits whenever it rises by 10-15% in quick time. The stock had made a high of 2500 also in 2008 🙂 ( So definitely we are pricing the stock on a very conservative basis ). Technically the stock can see a huge run up on closing above 950-980 levels. Now thats a consolidation for like 2 + years now !! Disclosure: The stock remains the highest holding in our Model Portfolio.Was 20-23 % of portfolio at one time when it dipped to sub 750 🙂 . Will review the stock at 950-1000 and 1100-1200 levels in short term. Remains a must in a 1-2-5 year portfolio. what is your view on Auto Corp goa, I bought it long back and still holding, do you see any trigger for this in long term? can you tell me the growth prospects of Marg Construsctions for short / mid / long term. Short term no major expectations but looks to be bottoming out in near term. this stock crossed 1010 Rs , is it a time to review this now? Booking 10-20% of the quantity at such moves is the better thing to do. Long term view remains extremely positive.